What a fantastic book, FIRST FROST is! It must have been a challenge to write and was, indeed, a brave thing to do - attempting to write a prequel to the much-loved books, and ever-popular TV series, by the late R D Wingfield, about DS William Edward Frost, or Jack, for short. FIRST FROST is first rate and accurately captures the character and atmosphere of the later books. Here we have Frost before he is really established, but still with his ever-present Macintosh, cigarette and cutting comments. Simply superb. In this, his first outing, young DS Frost has been given so many cases to solve that it seems highly unlikely he will succeed at any of them. Amidst an atmosphere of under-staffing and the, somewhat inappropriate, renovation of Denton police station, there is the case of the teenager that goes missing from a department store, then the unidentified body floating in the canal, the former PE teacher found dead in her bed, and the disappearance of Frost's good friend and colleague DS Williams, not to mention the strange outbreak of rabies, the mysterious phone calls from men with Irish accents and the disturbingly violent bank raids. On top of everything else, Frost doesn't seem to have the time, or desire, to go home to spend time with his wife, or even sleep in his own bed. He keeps waking up either in his car or at his desk and his ever-looming wedding anniversary is causing him even more problems, as he keeps forgetting to organize a surprise for his wife. 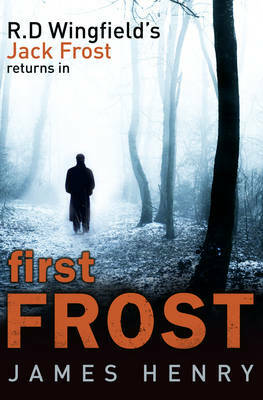 Entertaining, well written and simply a joy to read, FIRST FROST brings one of the best-loved heroes of British crime fiction well and truly back to life.